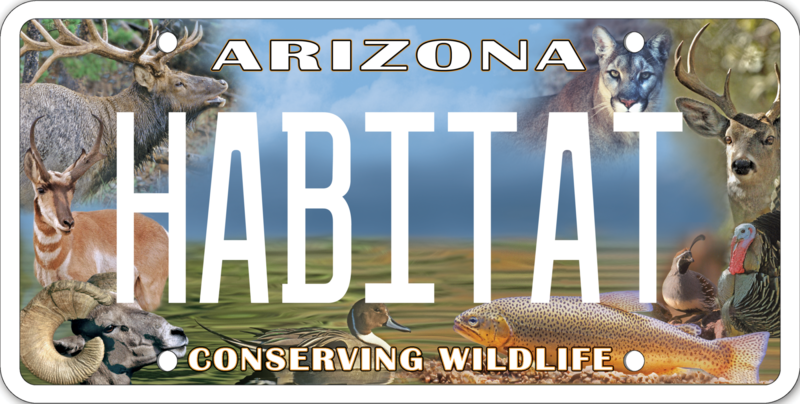 Arizona Sportsmen for Wildlife Conservation is pleased to present this beautiful specialty license plate. By purchasing this plate you will be making a contribution to Arizona’s wildlife and wildlife habitat. Seventeen dollars ($17) of each twenty-five ($25) special license fee will go to AZSFWC’s Wildlife Conservation Habitat Fund. The AZSFWC will review and approve all grants from the special license plate program revenues. These grants will fund important outdoor recreational and educational opportunities and on-the-ground wildlife habitat restoration and enhancement projects. These plates can be purchased at MVD offices around the state or online, and can also be personalized with up to seven (7) characters with an additional $25. If you wish to personalize your plate, click on “Personalized/Specialty Plates” to check its availability. Once you have verified the availability of your personalization, or if you only want to order the AZSFWC Conservation Special Plate, click on “Order My Plate”. Order your plate as a sequential shelf plate for $25.00 per year or as a personalized plate for $50.00 per year. The AZSFWC Conservation Plate gives all Arizonan’s an opportunity to contribute to programs that benefit our wild creatures. Step up and support “Wild Arizona”. To see a list of projects that have been funded by the revenue from the license plate program, CLICK HERE. For information on obtaining a grant CLICK HERE.